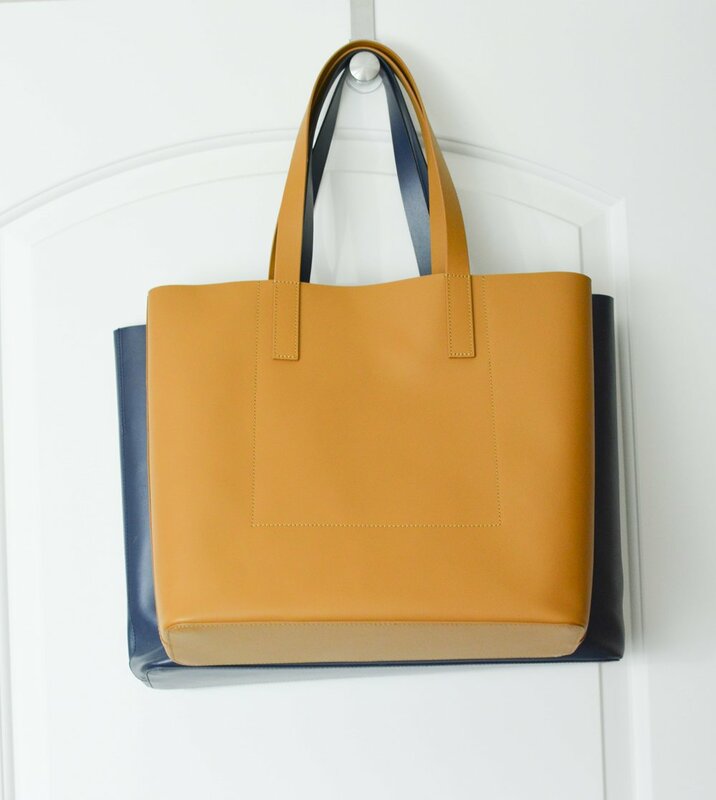 If you're wondering about the title, I called this two-part-post series as "Tale of Two Totes" because I started using both this Everlane Day Market Tote and the Celine small cabas phantom (reviewed here as Part 1) at pretty much the same time. Both are really great totes but very different. I use the Celine tote as my everyday personal bag, while the Everlane tote is my work bag (having replaced my Everlane dipped zip tote, similar here). I decided to upgrade my twill tote to the leather market day tote because I found the twill tote a bit too small for my work needs. I originally liked that the twill tote could be fully zipped, but for my day-to-day work life, I don't really need a zipper with my tote. Instead I needed a tote that could handle all the things I pile into it. And the Day Market Tote does that perfectly! The leather on this Market Tote is interesting. I own a lot of bags and haven't really had a bag with this kind of stiff but lightweight leather before. 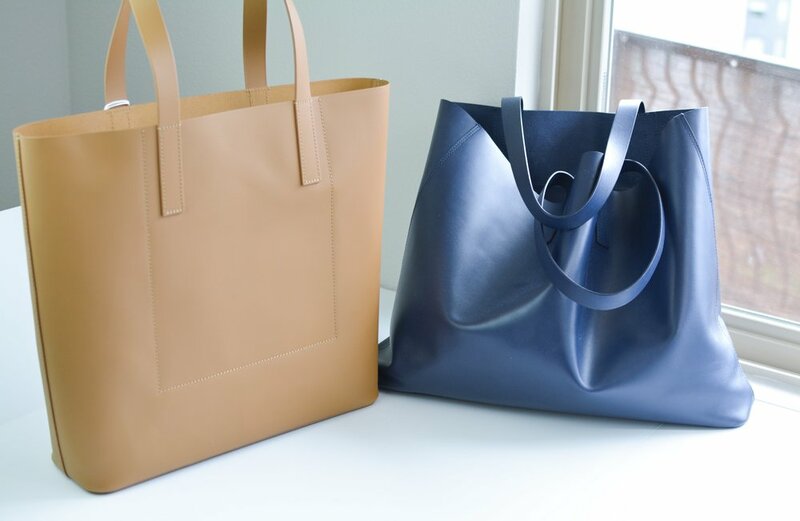 The leather of this tote most closely resembles the vegetable-tanned leather of the Mansur Gavriel tote (with the difference being the MG tote has that patent leather-type of colored interior). The MG tote is also a bit shinier and stiffer than the Everlane tote. The Everlane tote is unlined with a flat (and rather useless) pocket on one side. We source our leather from cows killed for meat, so the material we use is a bi-product from the meat industry. Instead of letting that material go to waste, we are using it to create bags and shoes. I believe it is sourced from exclusively adult animals. We label it Italian leather because it is tanned in Italy. We use both vegetable tanning and chrome tanning in the processing of different products. In the case of chrome tanning, we use only chemicals that have passed all environmental compliance laws currently in place. To the best of my knowledge, we chrome tan for our more brightly colored leather products, and vegetable tan for the rest. I think if you're debating between this tote and the Mansur Gavriel tote I would definitely go with this one. Not only is the sourcing of the leather for the Everlane bag more transparent and ethical but I think the quality of the Everlane tote is better too (especially in light of all that I learned from this blog post). - If you love that leather smell on bags, this tote is for you. For some reason the leather on this still smells like leather even after a month of daily use. Everlane's website description recommends treating the bag before first use, and I would agree that's a good thing to do. Being the lazy blogger that I am, I did not (though I could say it was for the sake of seeing how this bag will stand up without leather treatments), and now there are several scratches and gouges. Compare that to my Celine tote (which I've been carrying for longer) that doesn't have any marks on it yet. So if you dislike marks on your bag, you might be better off with something that made of soft pebbled leather (like the one from Cuyana). 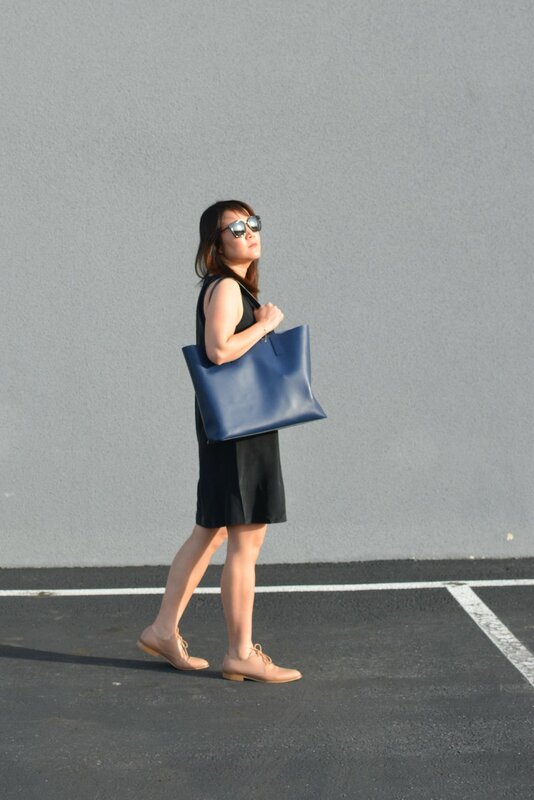 Right now this tote in this navy color is sold out, though other colors are available. And if you're a first-time Everlane customer, please help support the blog with a purchase through my referral link so that I can continue to write a plethora of Everlane reviews (and thank you to all of those who used my link in the past for your support! ).